You’ll Exit at Some Point—Are You Ready? Home > Exit Planning and Transition > You’ll Exit at Some Point—Are You Ready? 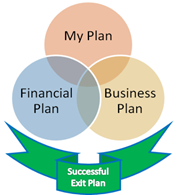 If you are like most business owners, your days are fast-paced, your activities varied and your time precious—it’s likely that you are among the 87% of owners who have no written exit plan. Yet, despite the value you’ve created in your business, you will exit at some point and need to figure out how to reap the fruit of your efforts while leaving a successful, ongoing business legacy. How can you maximize the business’s value between now and when you’d like to sell? How do you attract and assess potential buyers? What kind of buyer makes sense—a partner buying you out? A family member? Other? Will you want to have a role in the business post exit? If so, what will it be? Are there other owners? What are their needs in all of this? Is the business ready to survive without you? Is there a successor who can take your place one day? Are the key players on board? Is there a clear, effective strategic plan? Is it being executed, helping maximize the value of your business for its sale? About the author: Steve Sharp is a senior consultant with Group50®Consulting and heads Group50’s Strategic Execution practice. Steve and the Group50 team are all former executives with well-known manufacturing and distribution companies who understand what it takes to put together and manage the implementation of a successful strategic plan and exit plans. Group50 has designed a series of strategic assessments, workshops and strategic execution tools that drive successful business performance. Call us at (909) 949-9083 or send a note to info@group50.com. Jim. Always good to hear someone remind us business owners about the elephant in the room. As well as being an entrepreneur and more recently an ecopreneur, I also lecture on Leadership, Entrepreneurship and Sustainability on several Bachelor of Business Programmes that are delivered in Vietnam and Singapore. Asia has a large percentage of family owned and run businesses. These can be small generational businesses, but equally can be multi-billion dollar concerns. Succession planning was one topic that all of my classes in Entrepreneurship debated passionately. The feedback I received time and time again is that in Asia, the cultural tradition of for example the oldest son being given prior rights to succeed the matriarch or patriarch of the firm is still a common practice. Recent evidence suggests that family businesses are more aware of the need to make managerial and board appointments based on merit, even if that means disrupting the internal family hierarchy and in some cases, hiring externally. However, the trends that have been borne out in many long term studies on the subject of succession planning in family owned businesses are mirrored in Asia, where I personally know of many business that have gone from hero to zero in one or maximum two generations. Jim, nice, straightforward strategic advice. We are a marketing and branding company that works with private equity and their portfolio investments to unlock brand value and accelerate exit. All too often companies rely on growth solely though focus on product and technology. However, to optimize a successful exit, at least 2 years (and like you suggest, 3 at a minimum) is the time to clearly align you business strategy and your brand strategy and understand and define your value proposition and messaging framework. This investment will allow the company to focus on accelerating customer acquisition and growth, competing more effectively and maximizing your exit story for potential investors so they can envision the future runway and value.